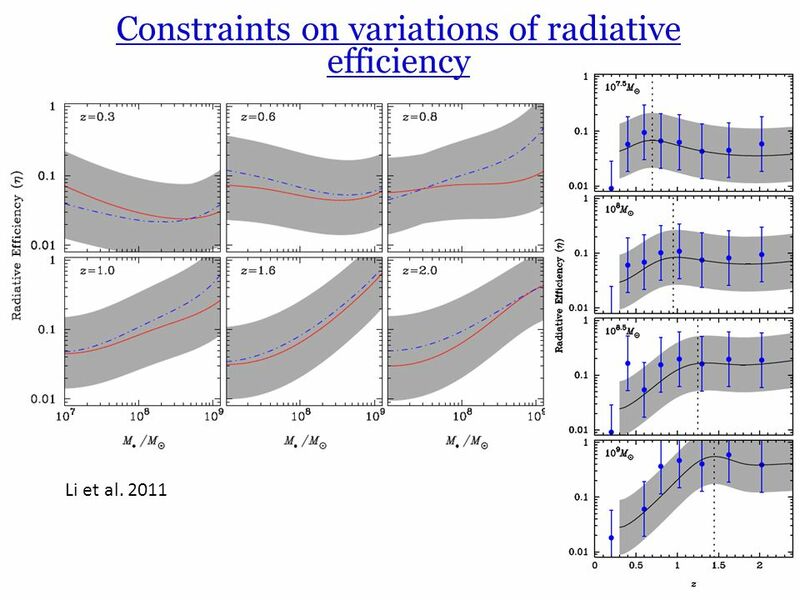 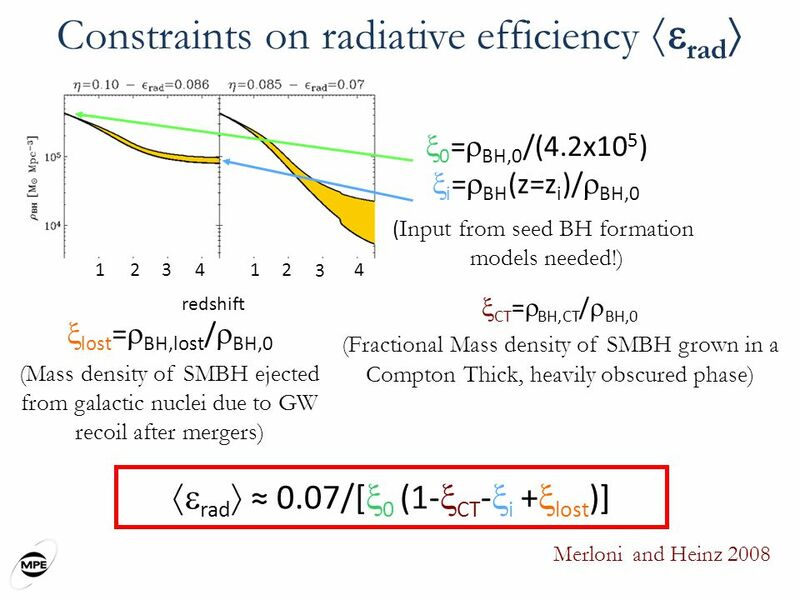 18 So far, I have assumed that the average radiative efficiency is constant (does not depend on mass, redshift, etc. 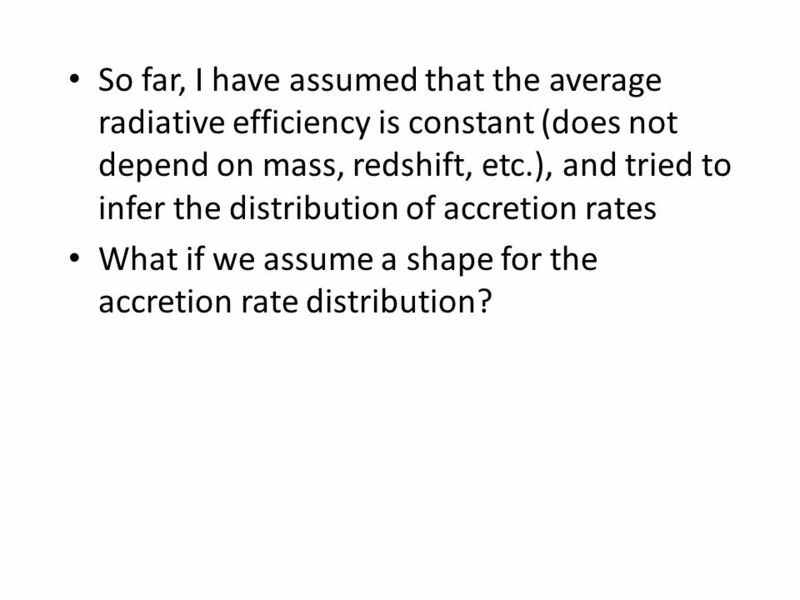 ), and tried to infer the distribution of accretion rates What if we assume a shape for the accretion rate distribution? 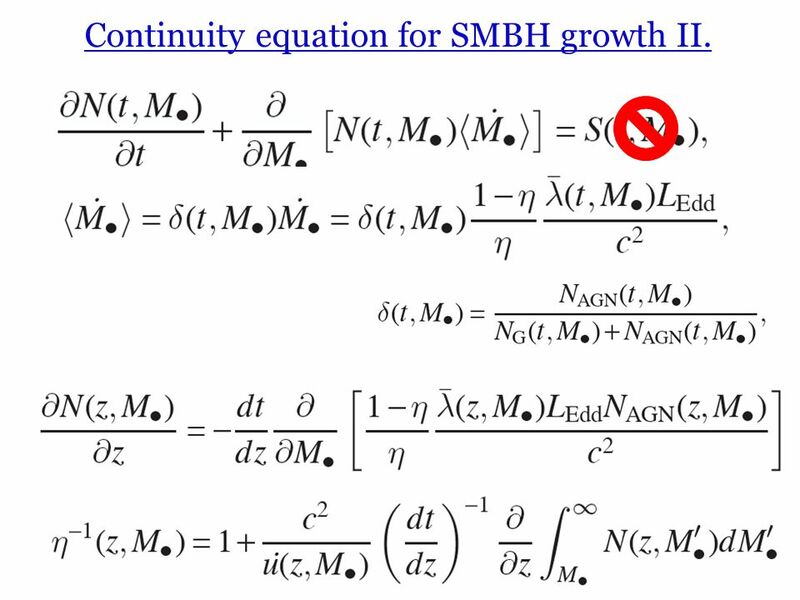 19 Continuity equation for SMBH growth II. 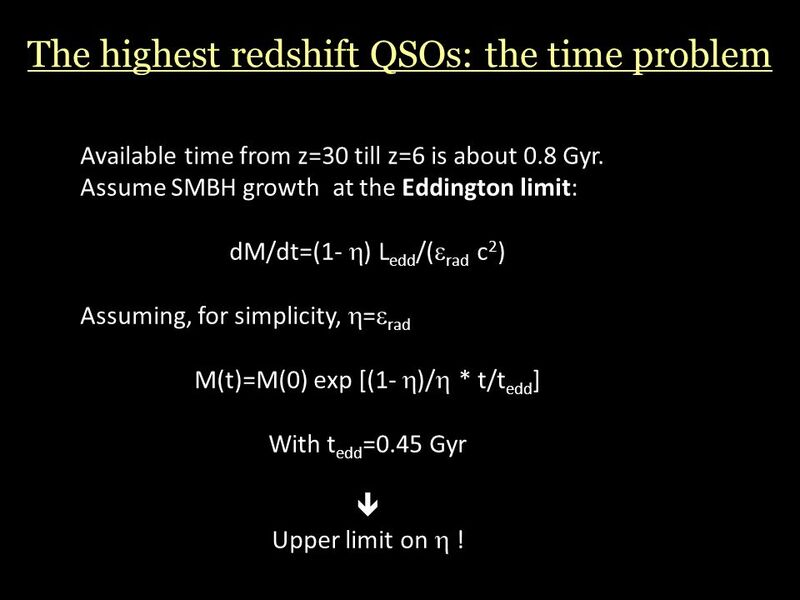 Available time from z=30 till z=6 is about 0.8 Gyr. 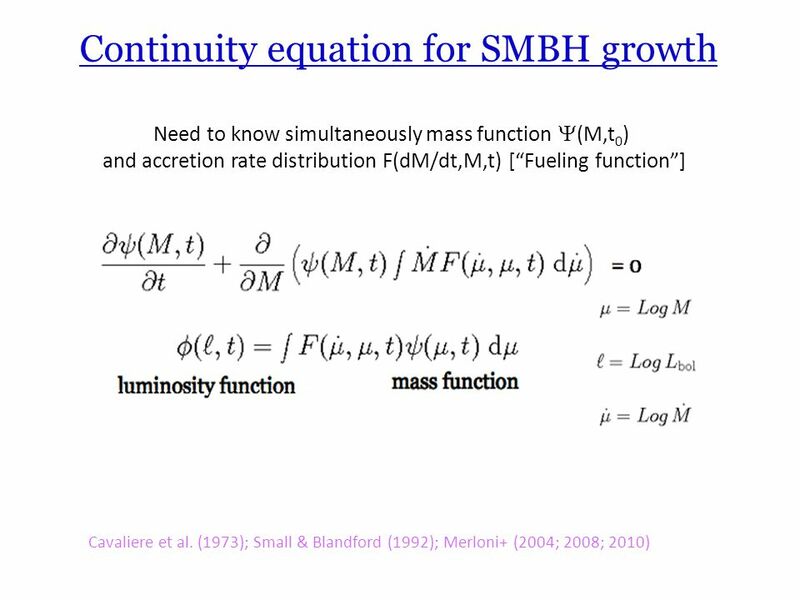 Assume SMBH growth at the Eddington limit: dM/dt=(1- ) Ledd/(rad c2) Assuming, for simplicity, =rad M(t)=M(0) exp [(1- )/ * t/tedd] With tedd=0.45 Gyr  Upper limit on  ! 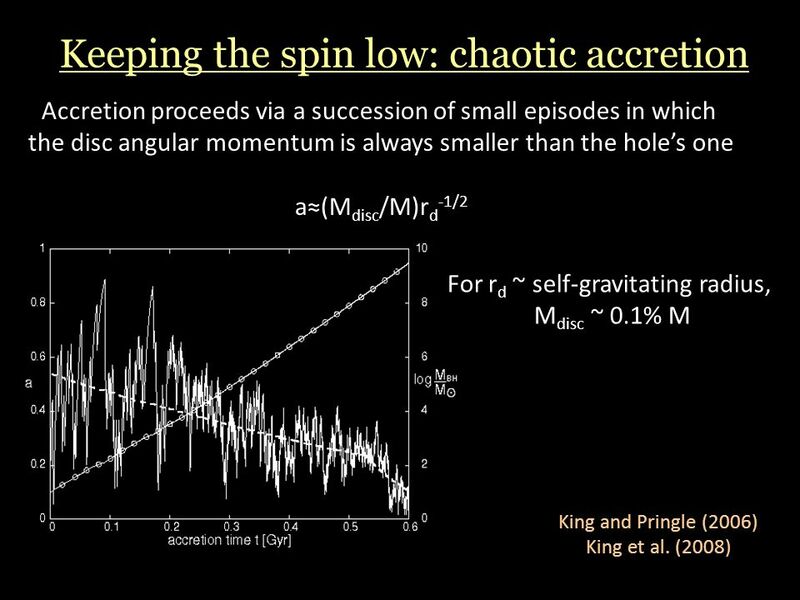 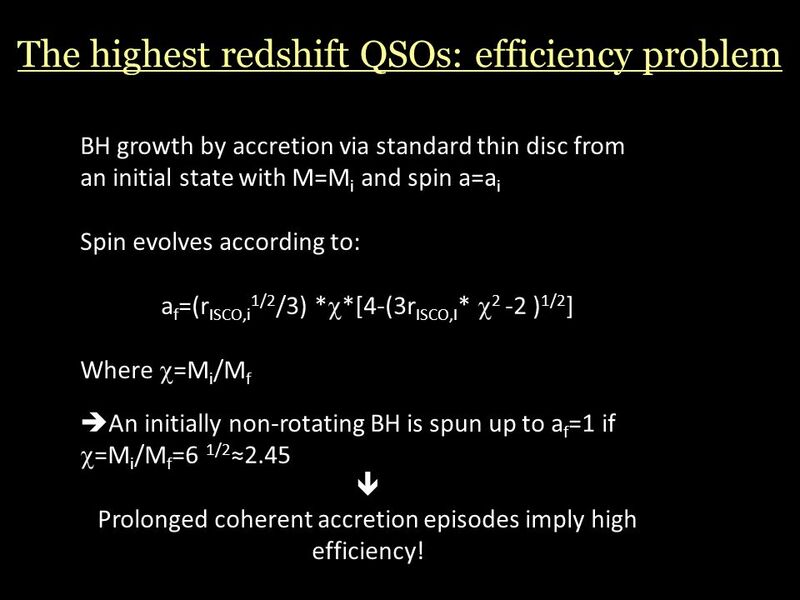 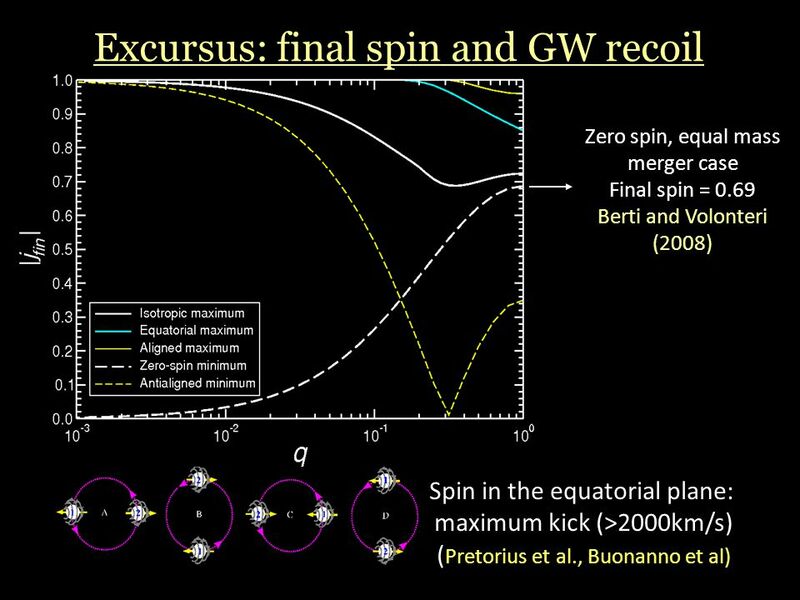 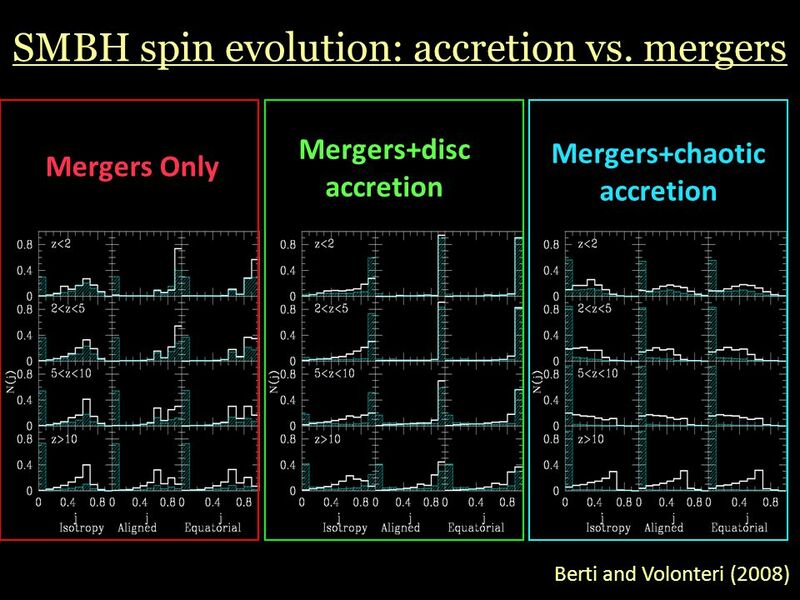 BH growth by accretion via standard thin disc from an initial state with M=Mi and spin a=ai Spin evolves according to: af=(rISCO,i1/2/3) **[4-(3rISCO,I* 2 -2 )1/2] Where =Mi/Mf An initially non-rotating BH is spun up to af=1 if =Mi/Mf=6 1/2≈2.45  Prolonged coherent accretion episodes imply high efficiency! 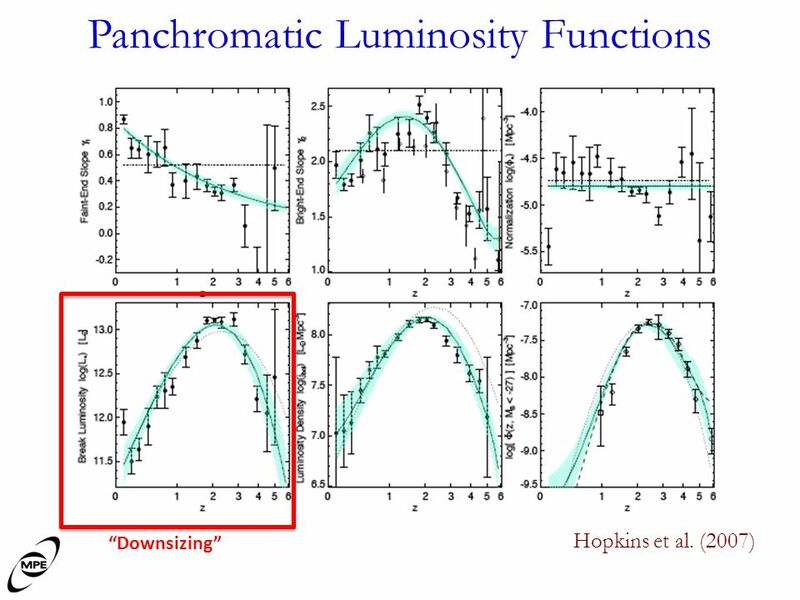 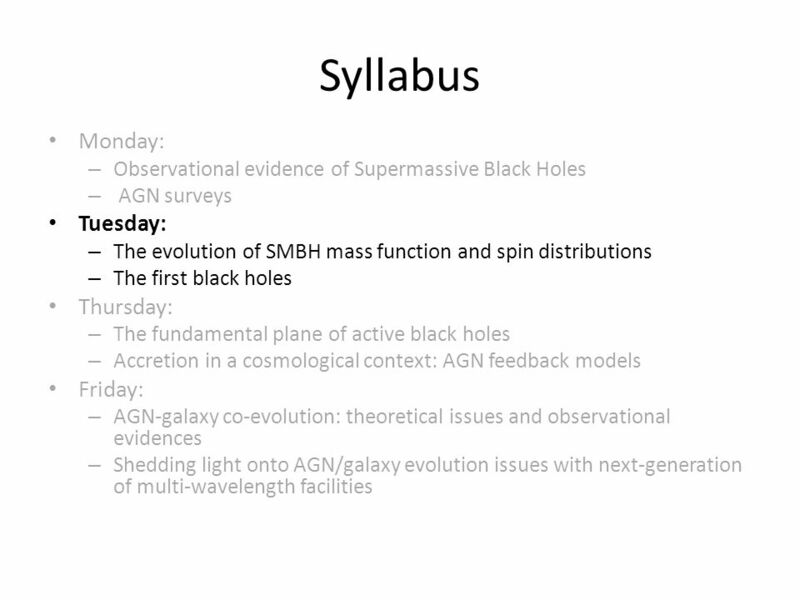 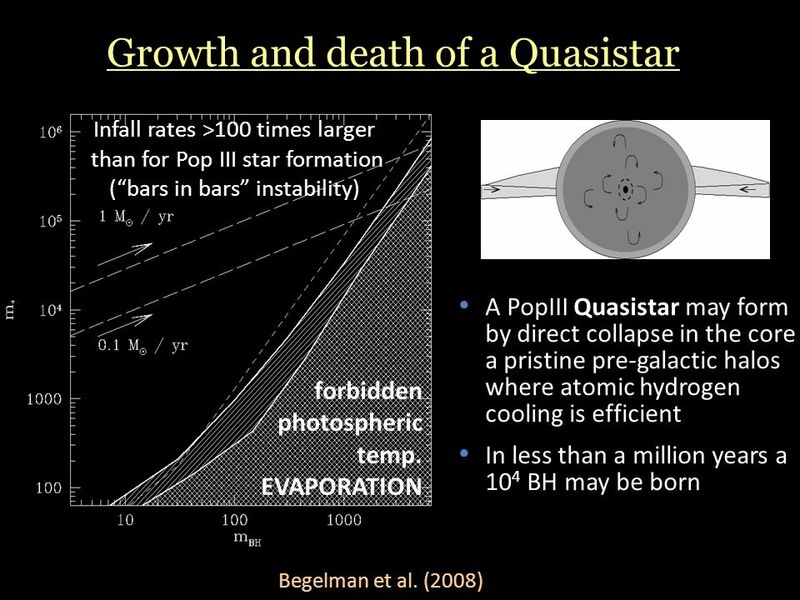 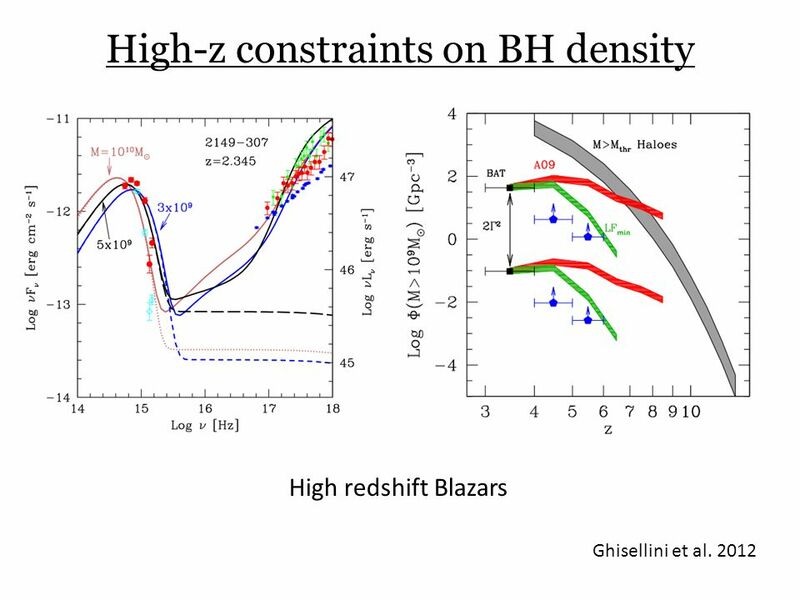 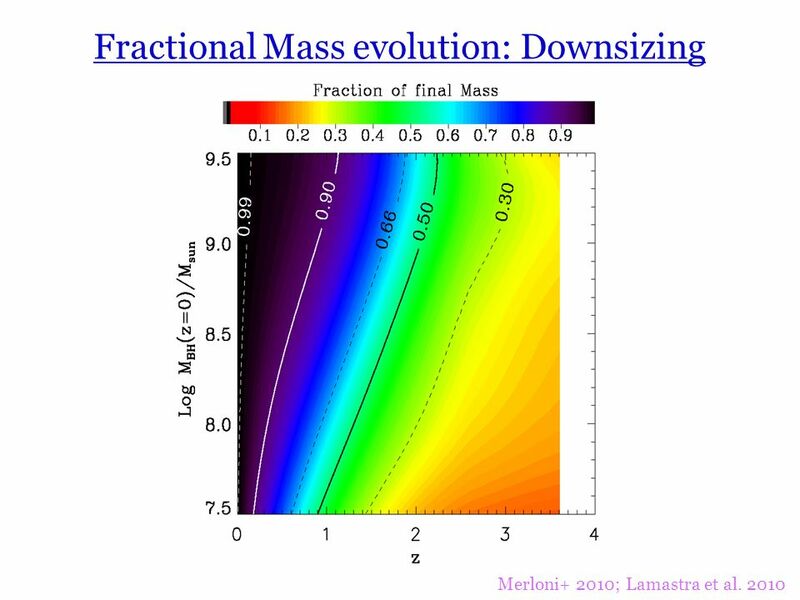 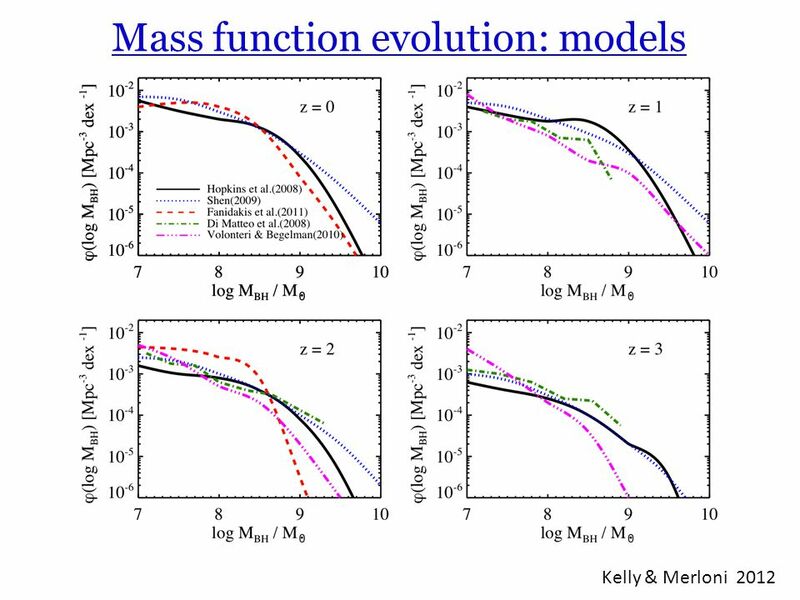 Download ppt "Formation and cosmic evolution of massive black holes"
Feedback Limits Rapid Growth Seed BHs at High Redshift Jianmin Wang, Yanmei Chen, Chen Hu Institute of High Energy Physics. 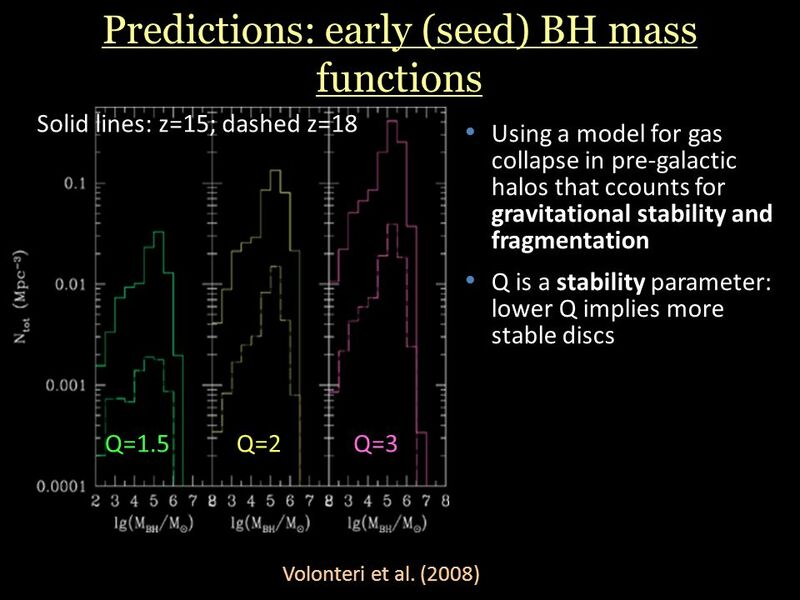 Stellar & AGN Feedback in Galaxies GLCW8 Columbus 2007. 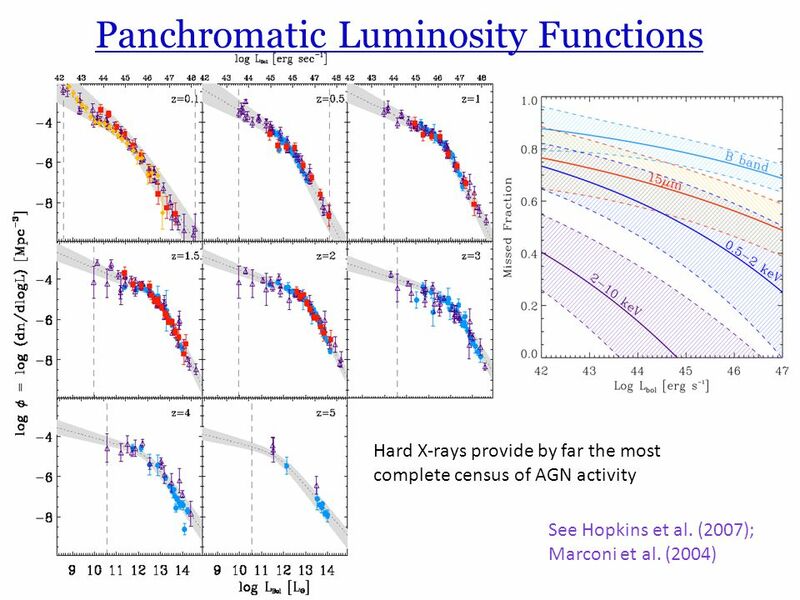 Grand unification of AGN activity across the universe Nikos Fanidakis and C.M. 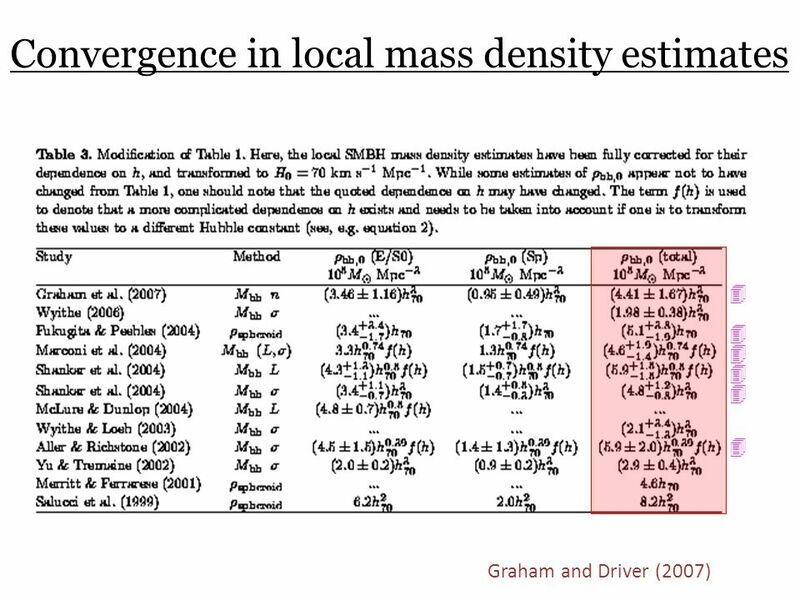 Baugh, R.G. 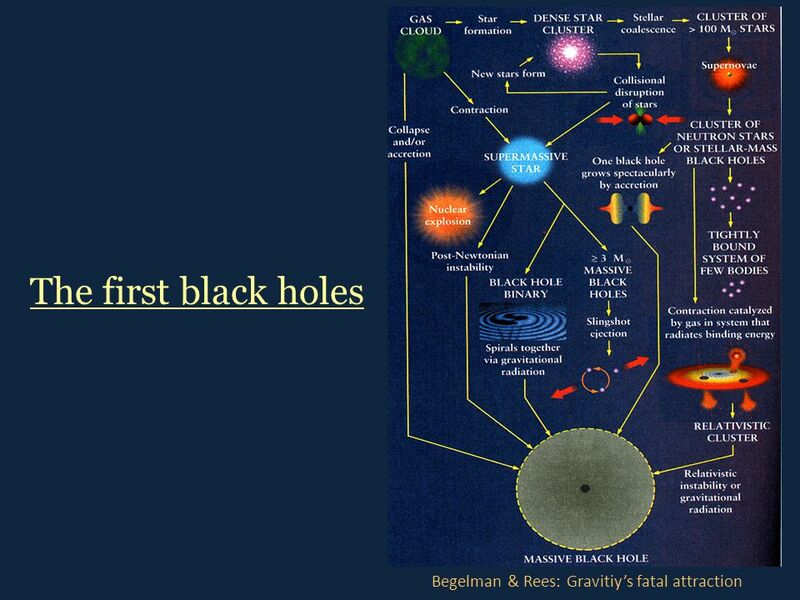 Bower, S. Cole, C. Done, C. S. Frenk 9 th Hellenic Astronomical. 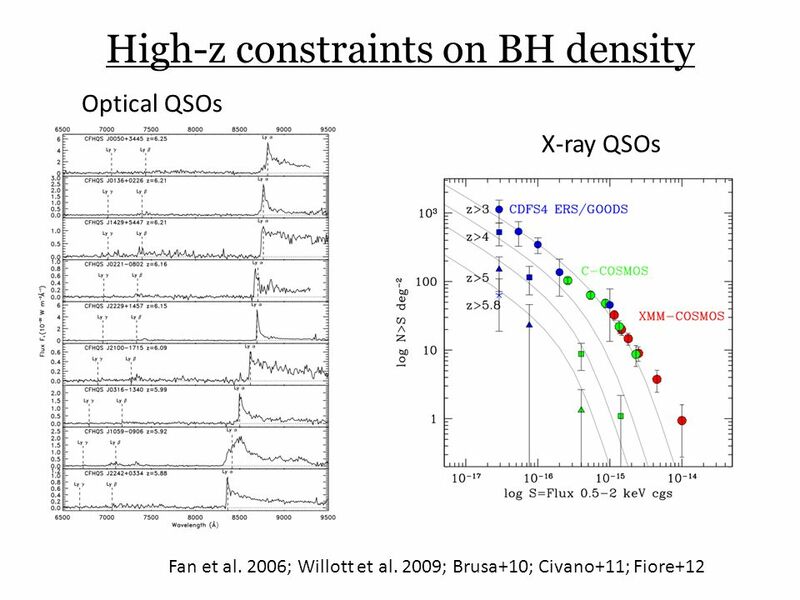 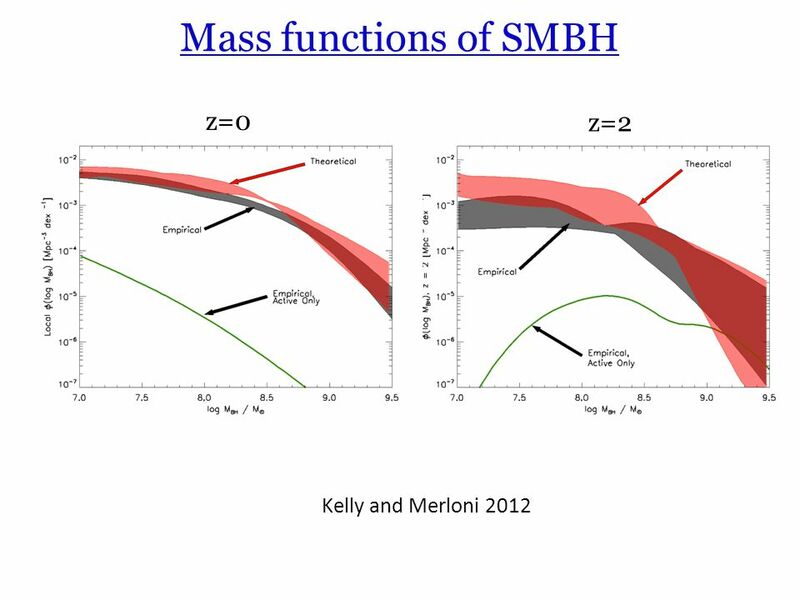 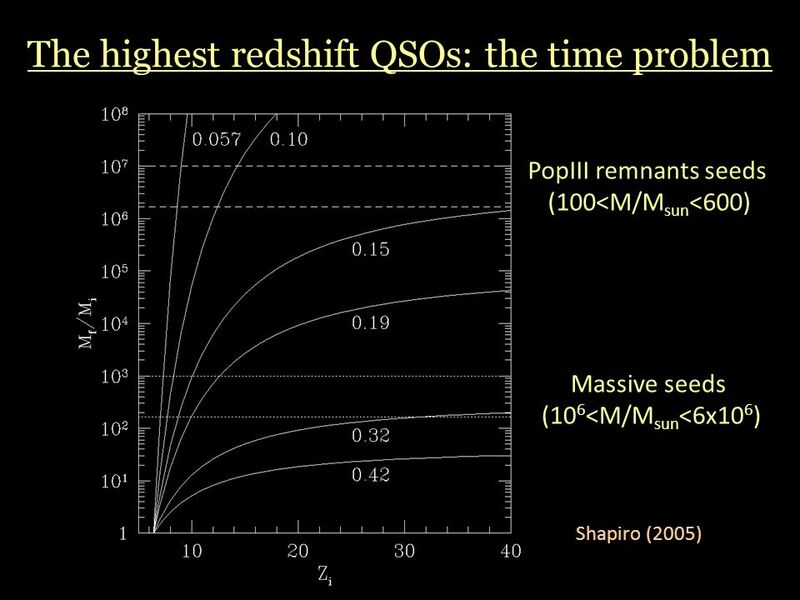 The evolution of SMBH from Hard X-ray surveys Andrea Comastri (INAF – Osservatorio di Bologna – Italy) The XRB as a tracer of SMBH mass density Hard X-ray. 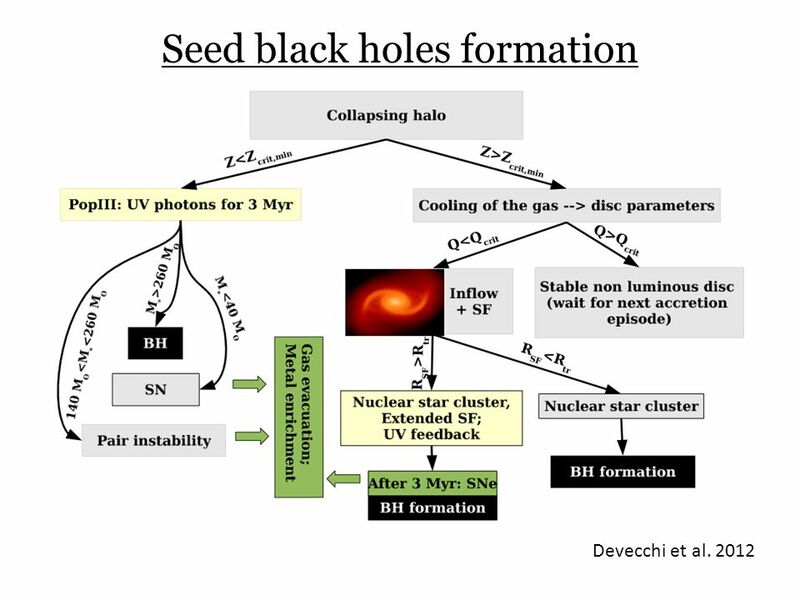 Growth of massive black holes during radiatively inefficient accretion phases Xinwu Cao Shanghai Astronomical Observatory, CAS. 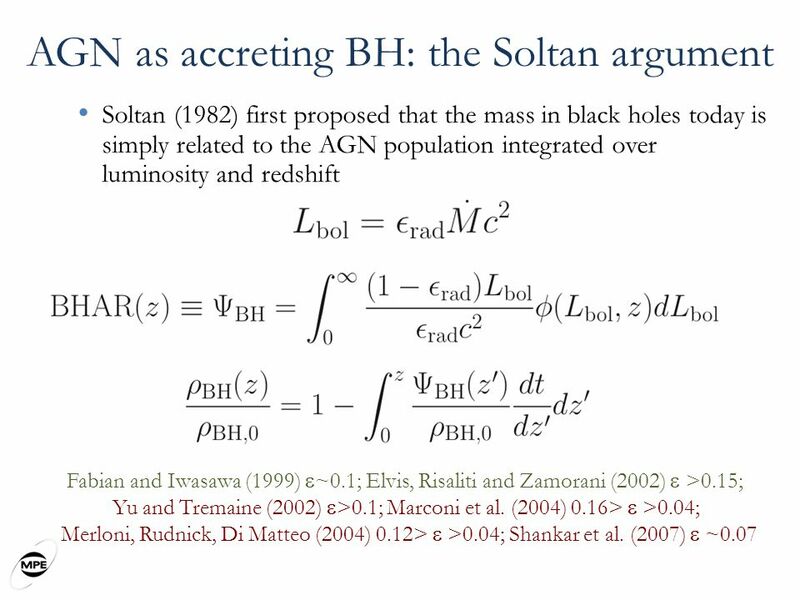 Federico Marulli, Dipartimento di Astronomia, Università di Bologna Modeling AGN properties in the local Universe Federico Marulli Dipartimento di Astronomia. 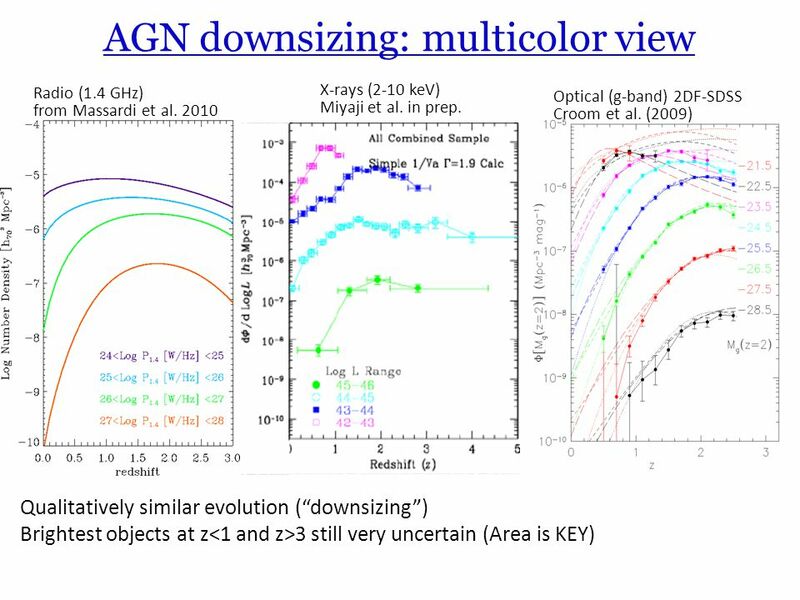 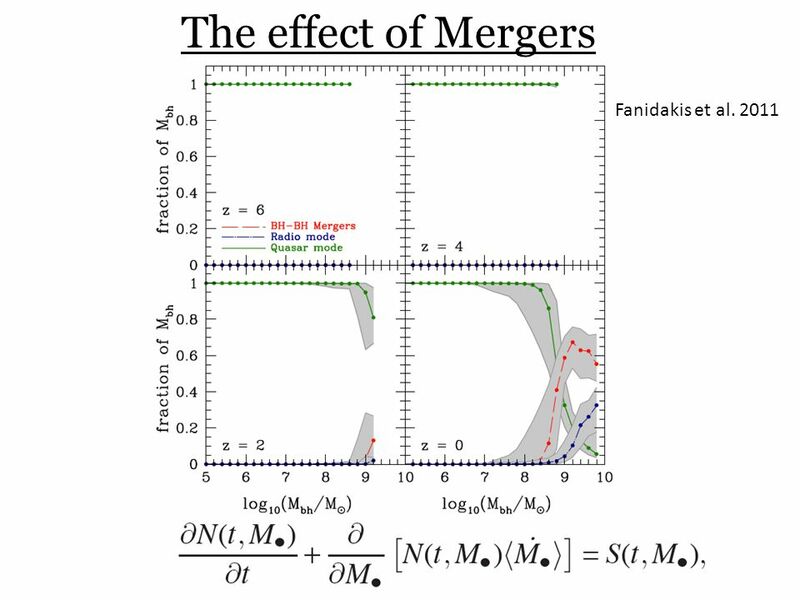 On the nature of AGN in hierarchical galaxy formation models Nikos Fanidakis and C.M. 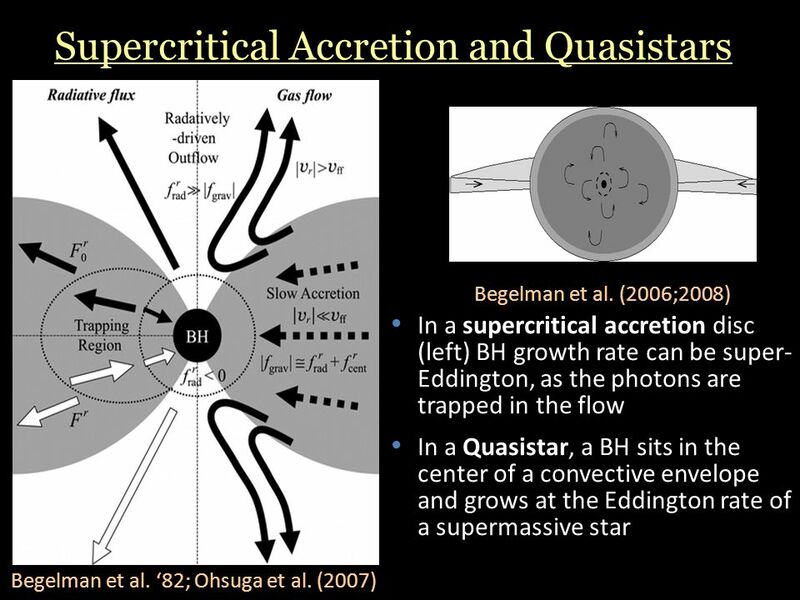 Baugh, R.G. 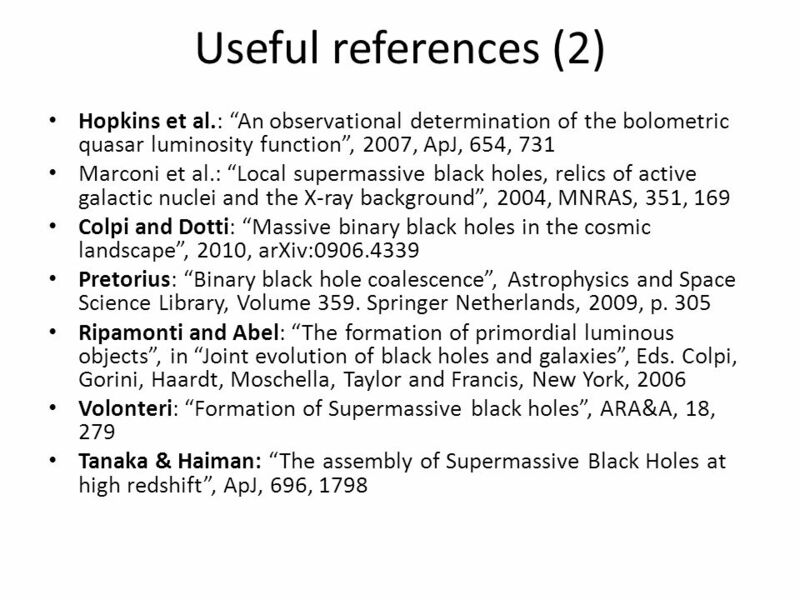 Bower, S. Cole, C. Done, C. S. Frenk Leicester, March. 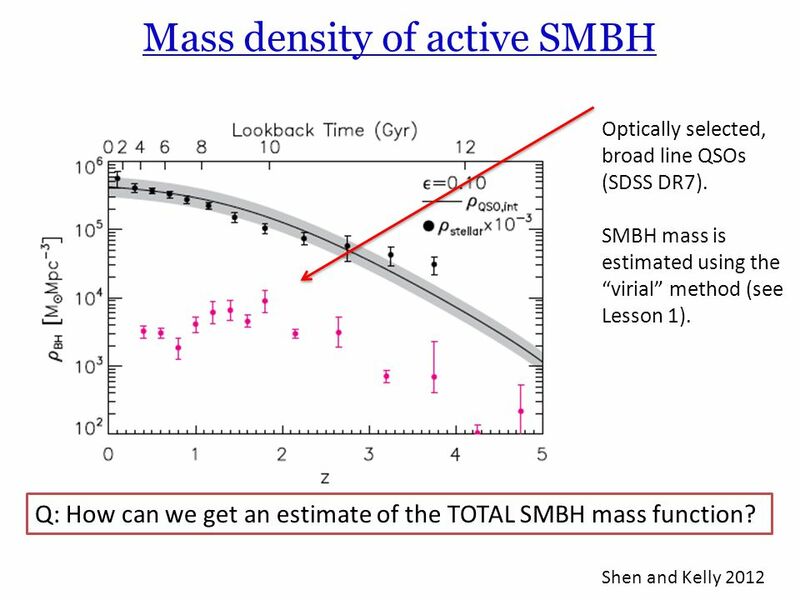 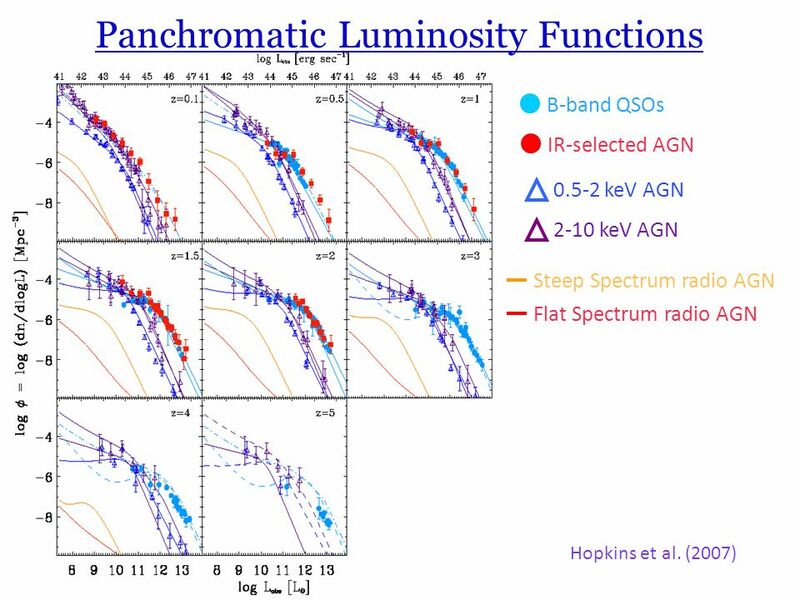 5GHz, VLA image of Cyg A by R. Perley Cosmological growth of SMBH: the kinetic luminosity function of AGN IAU Symposium 238Prague22/08/2006 IAU Symposium. 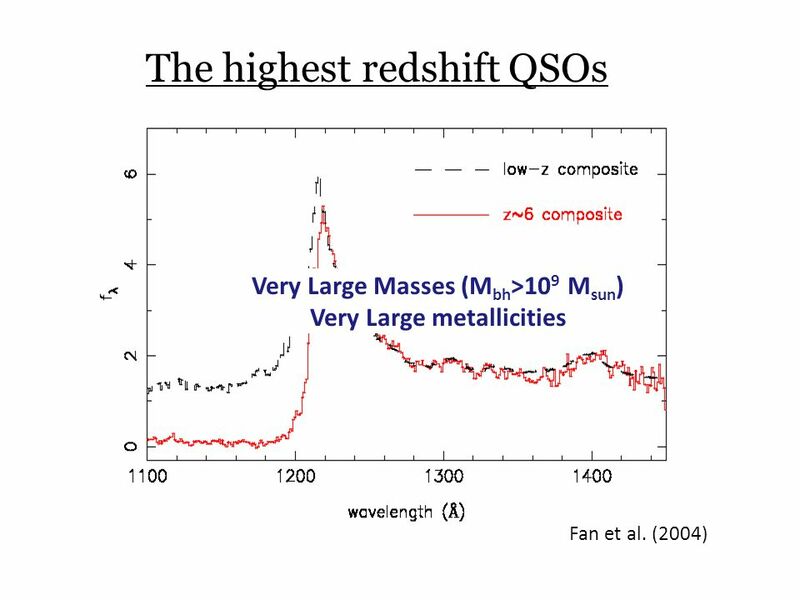 Quasar Luminosity Functions at High Redshifts Gordon Richards Drexel University With thanks to Michael Strauss, Xiaohui Fan, Don Schneider, and Linhua. 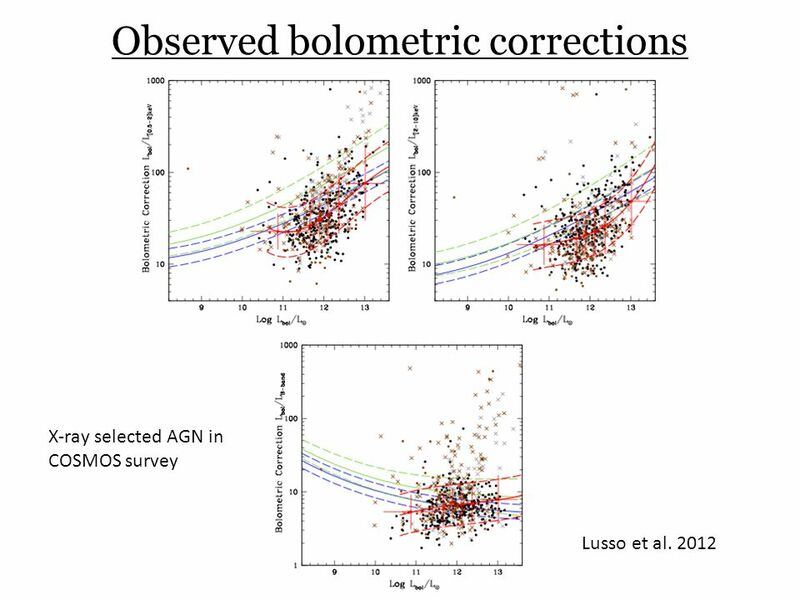 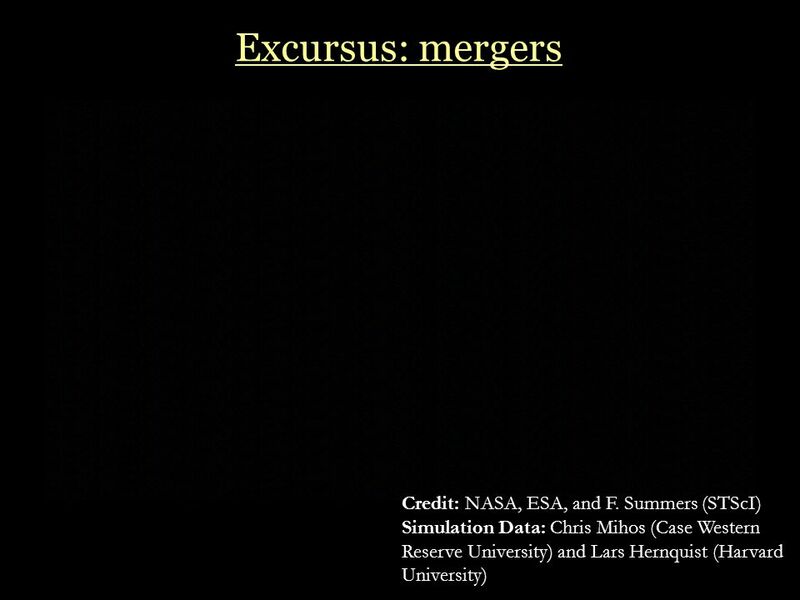 Luminous obscured quasars in the HELLAS2XMM survey: the Spitzer perspective Cristian Vignali Dipartimento di Astronomia, Universita`degli Studi di Bologna. 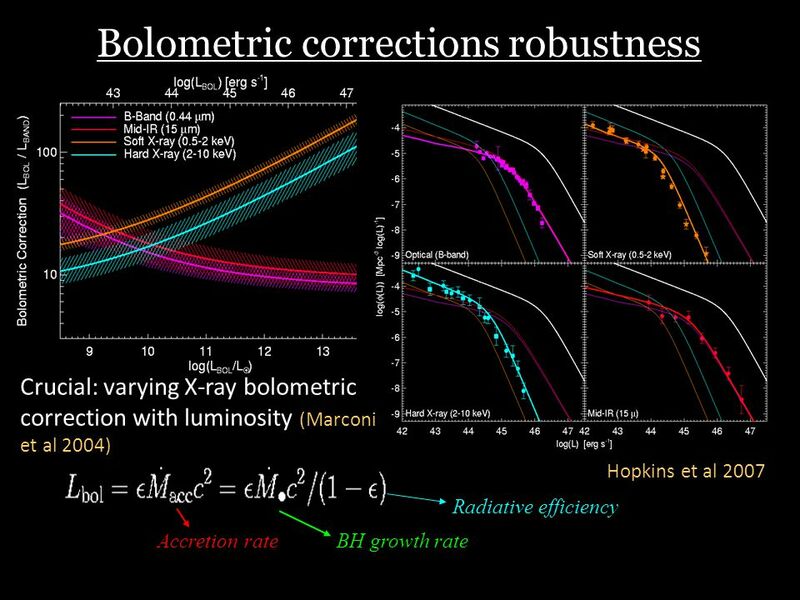 Everything you wanted to know about the X-ray background … Andrea Comastri (INAF-OABologna-Italy) Andrea Comastri (INAF-OABologna-Italy) Gilli R., Comastri. 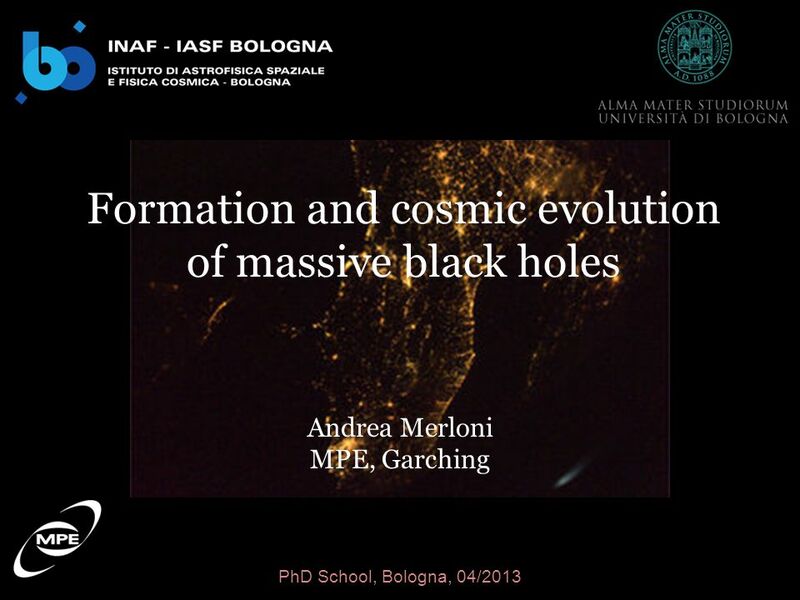 The relation among black holes, their host galaxies and AGN activity INAF ISTITUTO NAZIONALE DI ASTROFISICA NATIONAL INSTITUTE FOR ASTROPHYSICS Galaxies. 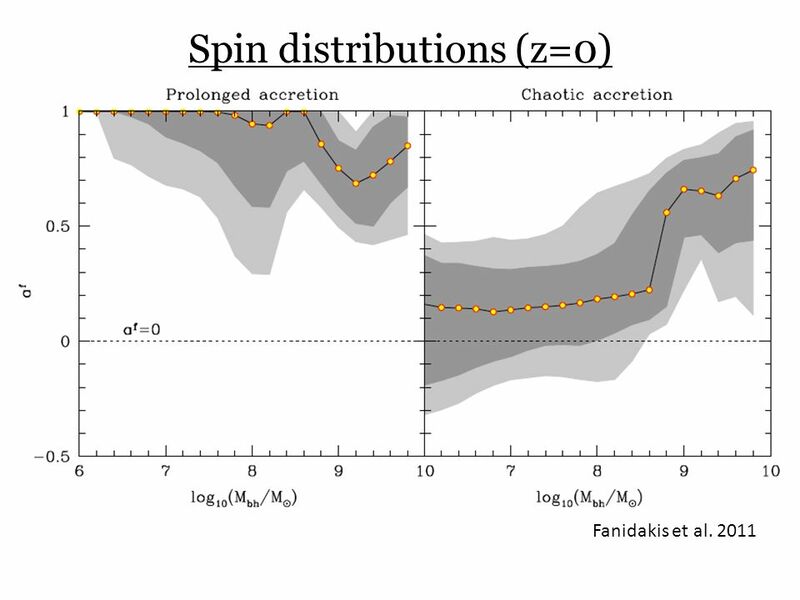 AGN in hierarchical galaxy formation models Nikos Fanidakis and C.M. 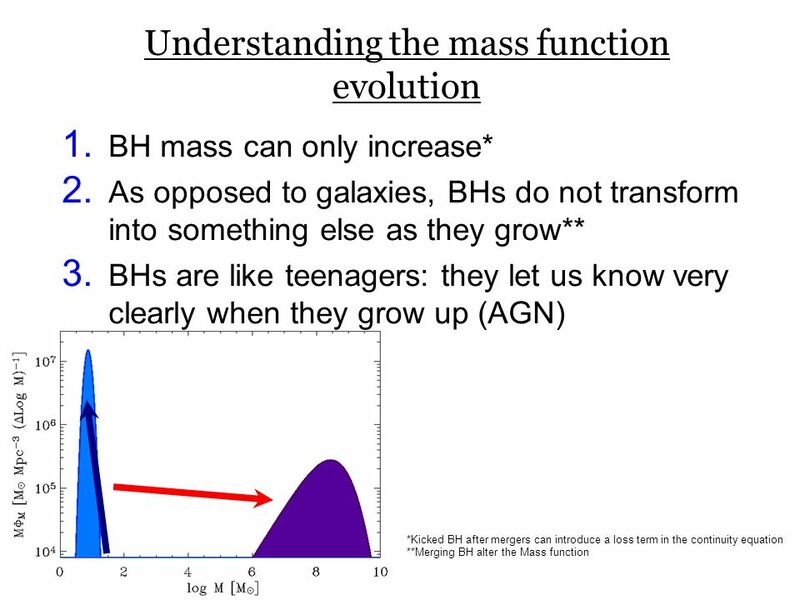 Baugh, R.G. 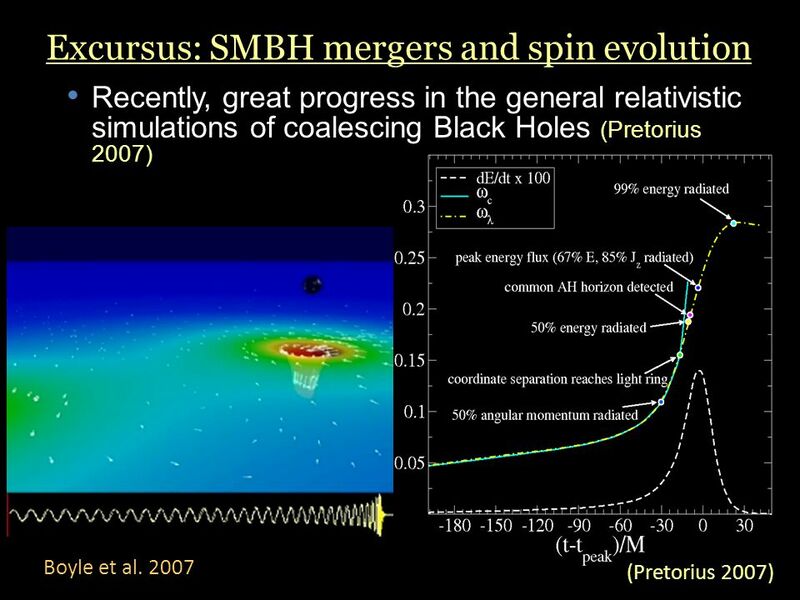 Bower, S. Cole, C. Done, C. S. Frenk Physics of Galactic Nuclei, Ringberg.